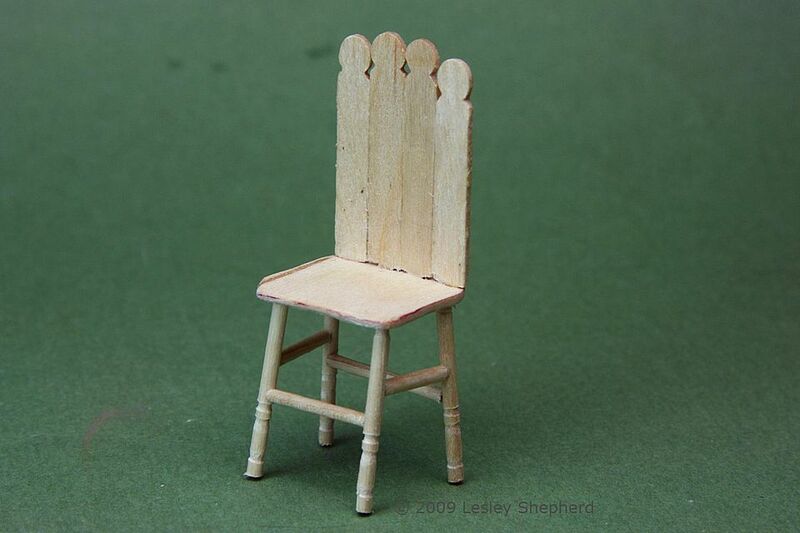 A dolls house scale child's chair made from toothpicks and wooden stir sticks. Photo copyright 2008 Lesley Shepherd, Licensed to About.com Inc. This easy project is a good way to explore miniature chair construction, without needing access to turned wooden parts. Depending on the finish of your stir sticks and your toothpicks, you will likely need to give your chair a painted finish. This will also hide any slight imperfections in your construction technique. The same technique of using toothpicks, can be used to make larger scale projects from fine wooden dowels. You can make stools of all sizes, as well as kitchen chairs, once you experiment with filing and setting dowels and slats in basic chairs. This chair matches the child's picket gate bed and uses the same technique of making pickets from stir sticks, to make the slats for the child's chair back. Stir sticks, toothpicks, glue, drill, saw and a hobby knife are the main materials for a dolls house scale chair for a child. Photo copyright 2008 Lesley Shepherd, Licensed to About.com Inc.
Four to Six Round Toothpicks If you can find ones with a design on one end as shown in these instructions use them. If you can only find plain toothpicks or are using dowels, you can use a needle file or fine sandpaper to create bands around the bottoms of the toothpicks. Small Scrap of 1/16 inch thick Basswood or Jelutong The seat size on this project is 7/8 of an inch deep by 1 inch wide, you will need a piece of wood this size. Needle Files You will need a small round file and a triangular flat file for this project. Hobby Saw to cut seat to size. A rectangular chair seat of basswood or jelutong is trimmed to round the edges and indent the seat front for a 1:12 scale dollhouse child's chair. Photo copyright 2008 Lesley Shepherd, Licensed to About.com Inc. Begin making the child's chair by shaping a piece of 1/16 inch thick basswood or jelutong to a chair seat shape. Cut a piece of stock one inch wide by 7/8 inches deep. Round the back and front edges with a flat needle file or sandpaper. The back edges should be slightly rounded, the front will be more rounded. Use the sandpaper or a file to indent the front of the chair slightly as shown. If you want to be really authentic, you can also sand out slight hollows in the back of the chair. A file is used to shape tenons on the bottom of the chair back slats which will fit into slots on the chair seat. Photo copyright 2008 Lesley Shepherd, Licensed to About.com Inc.
Use a file to shape wooden stir sticks into picket shapes. You will need to have enough pickets to make a back for the chair that is about 7/8 of an inch wide. Cut the pickets to a length 1/8 inch longer than you want the chair back to be. The pickets shown were cut to a length of 1 1/2 inches, with the center pickets slightly longer to shape the top of the back. Use your flat file to shape tenons on the bottom of each picket as shown in the photo. Use the flat file on all four edges of the base of each picket, to make the wood thinner at the base. These tenons will be inserted into slots on the seat to hold the chair back in place. Try to make each of the tenons 1/8 inch deep, with a uniform square edge on the bottom of the picket against the tenon. Glue your pickets together on the sides to form the back of the chair. Set them aside to dry. A mini drill is used to make slots in the seat back which will accept the tenons cut on the base of the back slats. Photo copyright 2008 Lesley Shepherd, Licensed to About.com Inc. Pick a miniature drill bit which has the same diameter or slightly larger, than the tenons you cut for the slats on your chair back. Hold the back (once the glue is dry!) about 1/8 inch in from the back edge of the seat, and mark where the tenons meet the seat. Using the mini drill, make a series of holes in a line to form slots for each tenon in the seat back. When the slots are cut in approximately the right places, use sandpaper or the fine end of a file, to gently clean out the slots. If possible, use sandpaper to angle the front edge of the slot slightly on the bottom side of the seat, so that the back will slant slightly when it is inserted. The seat back is fitted in the slots drilled in the seat of a dolls house child's chair. Photo copyright 2008 Lesley Shepherd, Licensed to About.com Inc.
Gently test fit the seat back into the slots you cut in the seat. If it does not fit, adjust the slots or the tenons so that you have as close a fit as possible. Be careful to avoid breaking out the back of the slots. If this happens, you can glue the tiny pieces back in place if only one slot is affected. If more than one breaks you will have to start again. Do not glue the back in place yet! Remove the back and set it aside until the legs are glued in place. Four legs are cut from decorative ended toothpicks to make a 1:12 scale dolls house child's chair. The ends are cut down with a file to make pegs to hold the legs in the seat. Photo copyright 2008 Lesley Shepherd, Licensed to About.com Inc.
Make legs for your dolls house child's chair by cutting four toothpicks to a length of 1 1/8 inches. Make sure the ends of the toothpicks are flat. You can use a file or a piece of folded sandpaper to make bands at the ends of the legs if your toothpicks or dowels are plain. At the plain end of the toothpick (the top of the chair leg) use sandpaper or a file to cut down the diameter of the dowel, making a short (1/16 inch ) peg on the top of the leg as shown in the photo above. The two legs on the left are ready to be cut down, the two on the right have been filed to create small pegs on the top ends. A mini drill is used to drill holes under the seat base to take the pegs formed on top of the toothpick legs for the dollhouse child's chair. Photo copyright 2008 Lesley Shepherd, Licensed to About.com Inc.
Mark the position of the legs on the underside of the seat. The back legs should be as close as possible to the back, without cutting into the slots for the back slats. Use a ruler to make sure the legs are lined up square. Use your mini drill to make a hole the correct size for the peg you created on the top of the legs. The front holes should be drilled at a slight angle to make the front legs angle forward as shown in the photo. Test fit your legs in the holes. With all legs in place, and the front legs angled slightly forward, test that your dolls house chair stands square. Photo copyright 2008 Lesley Shepherd, Licensed to About.com Inc.
Test fit all four legs onto your chair, line them up in approximately the correct position and set the chair up right side up to make sure it will stand on a flat surface. If the legs are not close to the back of the chair, the weight of the back may cause it to tip. Adjust the fit of the legs if needed. Usually there is at least one leg which is slightly too long. Use a file to file it down to size , recreate a peg on the end, and fit it back into the peg hole. When all four legs are the correct length, insert the pegs into a small amount of glue and glue them into the holes on the underside of the chair, making sure they line up square on the back, and angled equally on the front. Leg braces cut from toothpicks are filed on each end to make a semicircular indent to hold them firmly against the chair legs. Photo copyright 2008 Lesley Shepherd, Licensed to About.com Inc. When the legs are securely glued in place, measure the space between the front legs just above the decorative ends. Cut a short piece of plain round toothpick slightly to large to fit between the legs. Use a round needle file to carve a hollow across both ends of the brace piece, make sure the hollow runs the same direction on both ends. This hollow will help the brace fit securely against the legs and hold them in place to strengthen the construction. Repeat this step for the brace between the back legs, lining it up so it fits at the same height as the brace on the front legs. Cut similar bracing for the side legs, this time cutting it so it fits above the bracing on the front and back. Run a small bead of glue into the hollow ends on each brace and glue them in place on the legs, set the leg and seat assembly aside to dry. Glue The Chair Back in Place When the legs and braces are securely dried, add a small amount of glue to the base of each tenon on the back of the chair, and carefully insert it into the chair seat, holding the seat, not the legs, while you fit it in place. Try to set the back at a slight angle more than 90 degrees from the chair seat. Wipe off any excess glue and leave the chair to dry. When the chair is dry, you can use your choice of finishes to paint it, or use wood stain and a clear finish.